I really want to try and bring my own unique approach to this set visit, because so many other websites with us. While you can read the interview transcripts and see photos everywhere else on the web, this is my own story, and these are my own thoughts about being on the Tron Legacy set that you won't find anywhere else. 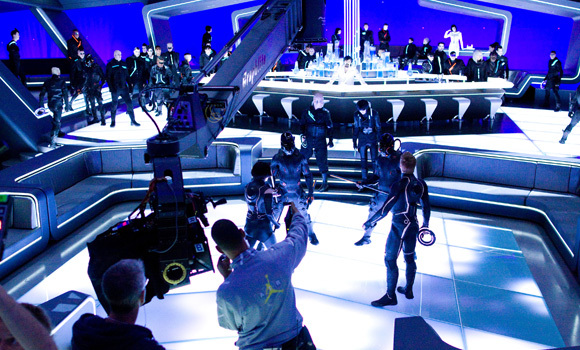 Although most of Tron Legacy will be digitized and include CGI enhancements in nearly every frame, the set we stood on and the world we were shown in Vancouver was a very real world. 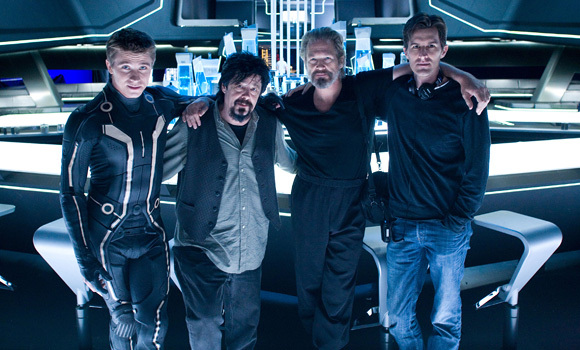 Director Joseph Kosinski (better known as Joe for short), who is a first-time feature filmmaker but a true visionary already, wanted to build as much of the physical sets as he could, even the pieces that were inside the Tron computer world and not the real world. Producer Sean Bailey told us early on in our visit that Joe originally said: "I want to use digital tools to build an alternative world that looks like I photographed it." Well it definitely looks that way! As you can clearly see from some of the photos included in this article, Disney did indeed let Joe build some massive sets, and although we only were able to step foot onto the set known as the "End of Line" club (run by that crazy-looking Michael Sheen), the concept art and production designs we saw in the "war room" (also coincidentally the same exact building where Zack Snyder built his own "war room" while shooting Watchmen a few years prior) were just as elaborate, enormous, and detailed. While other filmmakers (need I mention George Lucas?) tend to shoot as much as they can with green screen, especially for a movie that takes place inside an entirely digital world, Kosinski opted for the opposite, at least as often as he could. "Joe very much wants this world to look completely real, like he shot it. So he came in very early and said, 'Sometimes I want to shoot people in actual full wardrobe, on an actual dressed set that's practically lit.' You'll see the suits are all lit. Sometimes they will be standing on a patch of blue screen and they'll be surrounded by blue screen and everything will be digitally fabricated and sometimes, like the set you'll see today - a big, big huge practically built set, but with huge open spaces that are blue screen to fill out the world beyond." If you've seen the trailer, you can easily get a sense of why it was so important to create an entire world like this, with physical sets and interaction as much as possible. Not only did he need that little bit of realism for the actual environment itself, but Kosinski needed the world to also extend out beyond in the background forever, to complete the illusion that this really was the computer world we were seeing, not the real world. I'm a huge fan of the original Tron as well, and it's been 28 years since that came out, yet this already looks like the perfect modern compliment. As is evident from the footage we've seen, photos we've been shown, and all that we've heard, it looks like Kosinski really is trying to push the limits of special effects and digital cinema the same way Tron did itself back in 1982, but with newer technology, including the latest in 3D technology. This is one of the few movies that was actually shot with 3D cameras, the same ones used on Avatar but a newer generation, so the 3D will look even better than it did in James Cameron's movie. "We tried to make some ambitious storytelling choices," Bailey said. "It's not a movie about the internet… It's not a movie that's about Blackberrys or wireless or satellites, it's its own universe that he gets pulled into it. And we also made a conscious choice, we don't have programs that are accounting programs or we don't say the word 'mainframe' in the world. The world, it just exists on its own. And hopefully then just the virtues of good storytelling and good action and direction and performance win the day." For now this is just a small taste of the world that Joseph Kosinski has created in Tron Legacy, and of the experience I had on set. It's dark and wonderfully sleek and expansive and I can't wait to see it on the big screen in its finished form. We weren't shown any real footage at all on the entire set visit, which is why my jaw dropped when I saw that first trailer a few months back in IMAX 3D. It was beautiful and yet edgy and intelligent and looked stunning. There's a reason why I've used Tron Legacy wallpapers on my computer for the last six months. It just looks amazing, there's nothing like it, and I can't wait to see even more from it. Stay tuned for even more reports from the Tron Legacy set over the next eight months or so, leading up to its release this December. And enjoy the behind-the-scenes photos attached to this as well. And while you're at it, fire up the new teaser trailer one more time, because I know I can't get enough of it myself! End of line. After seeing the trailer this weekend on the big screen, I am completely stoked for this one. Hope it lives up to my hype!! They should use Motion Capture only. It's computer world, isn't it? I'm in the wrong business. I need to start a website. I fell in love with the Trailer once it hit the web... I recently saw it in theaters in front of the Alice movie... It gave me the chills...especially the part from where his dad starts talking to the end... CAN'T WAIT!!!! I said this on Twitter to Alex, but I'll say it again, you lucky, lucky bugger!!! 😉 This is going to be the film of the decade [for me]. I took yesterday off work and watched Tron again with all the extras from the bonus DVD. It's still brilliant. Must re-install Tron 2.0 and play that through. Still won't be enough. So hyped by this film. December is too far off. The Suits look fantastic! Do you know what they've made them out of?